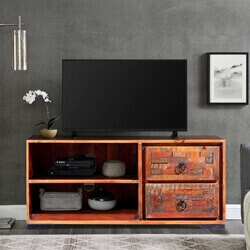 Music, movies, and TV allow us to unwind, relax, and celebrate the world around us, so why not create a special place for your media and entertainment. 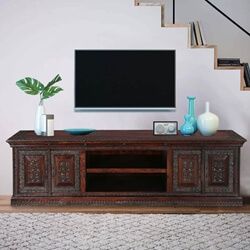 Our handcrafted, solid hardwood media consoles and entertainment center offer spectacular platforms for the stuff you want to see and both open and closed storage for the other stuff you want nearby. 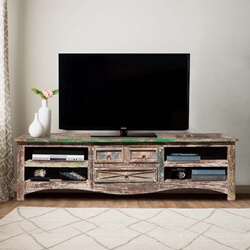 Each TV stand and entertainment cabinet is built by skilled craftsmen using classic techniques, always focused on getting the details right. 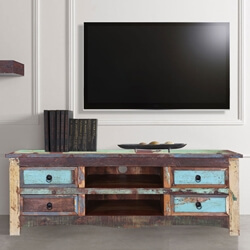 We never use veneers, plywood, or particle board. 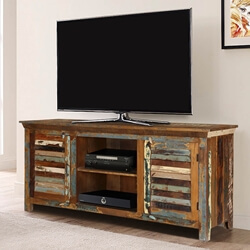 We build each media island with premium hardwoods; Indian Rosewood, Mango wood, Acacia, and Teak as well as carefully selected reclaimed wood. 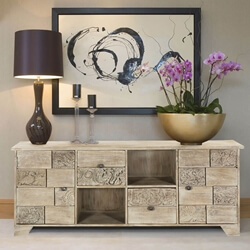 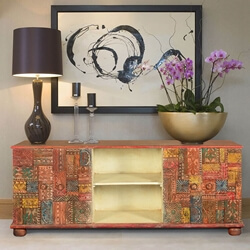 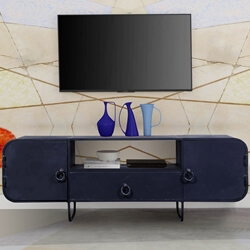 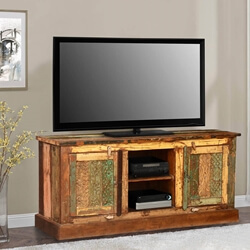 We are proud to offer over 270 different entertainment sideboards and TV tables. 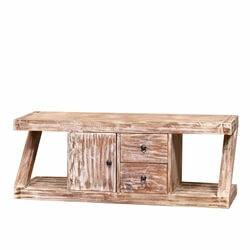 We offer cabinets that sit on the ground and others that stand off the floor. 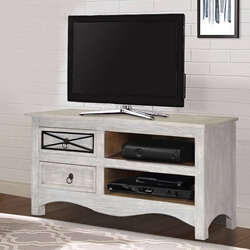 Choose from medium, long, and extra-long lengths; we offer consoles for every size television and big screen. 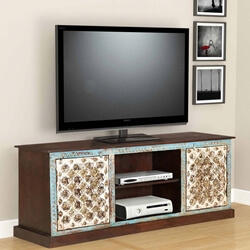 Our designs include open backs and cutouts, cabinets, drawers, and open shelves. 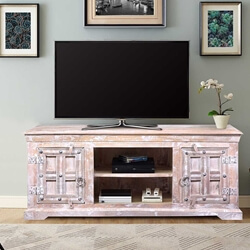 Look for counter tops that extend beyond the frame, are flush to the corners, and rounded corners (those are especially great for families). 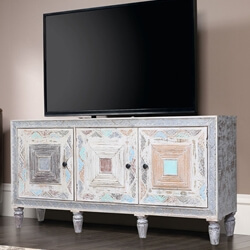 Media island details include hand-carved designs, decorative hardware, hardware-free fronts, brass or iron elements, and hand painted designs. 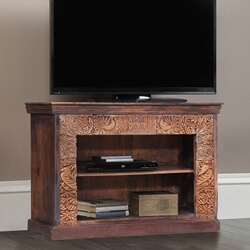 Our classic styles include Gothic, Nottingham, New Delhi, Shaker, and Tudor designs. 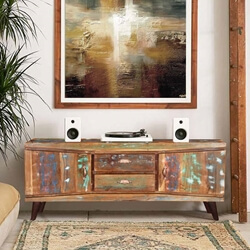 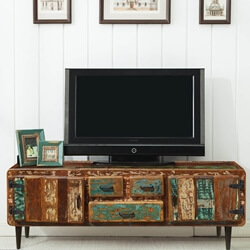 You’ll find Contemporary style entertainment cabinets under Retro, Industrial, Santa Cruz, and Pop Art titles. 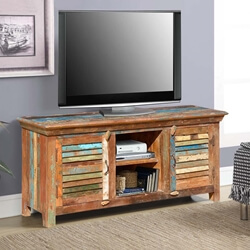 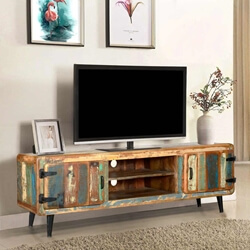 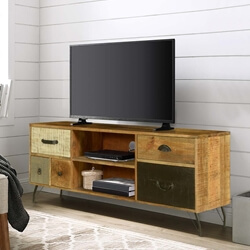 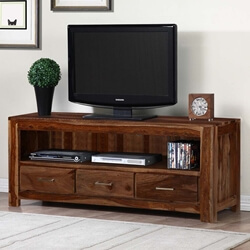 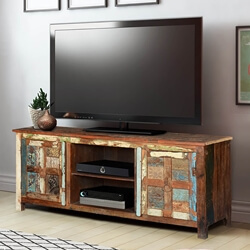 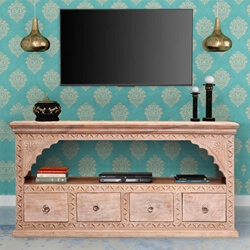 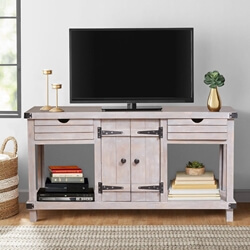 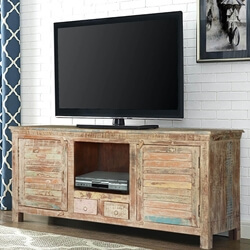 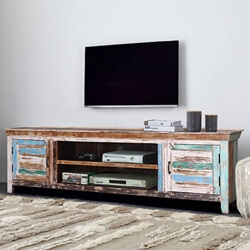 Find natural and rustic media consoles in our Appalachian, Pioneer, Farmhouse, and Log Cabin collections. 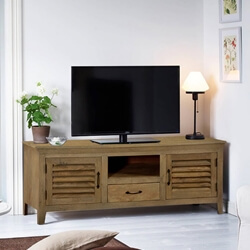 Many of our TV consoles can be customized, so if you’d like a different shade or a size adjustment, please contact us. 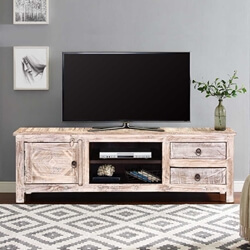 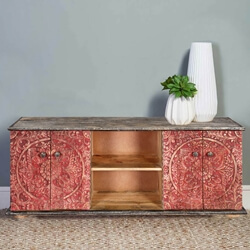 Our diverse collection of media islands and TV cabinets make it easy to find the perfect piece for your media center, living room, or any room where you enjoy music, movies, and shows.